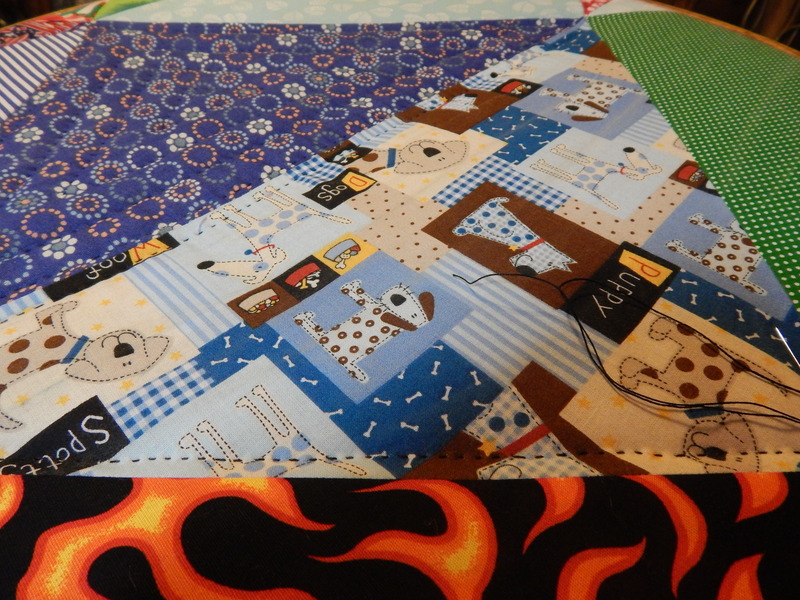 I started hand quilting the Teddy quilt. Teddy is an on top of the quilt guy so I wanted the quilt to be very thick and puffy. 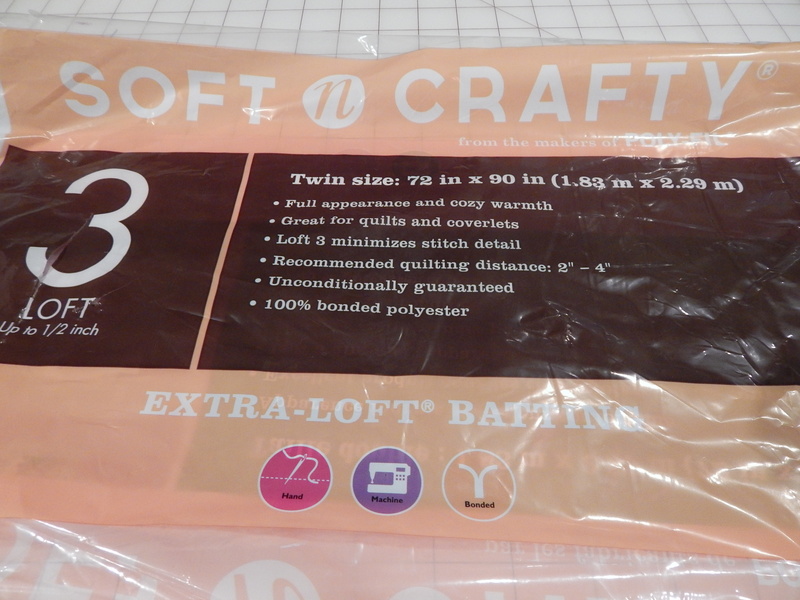 I used an extra loft poly batting. 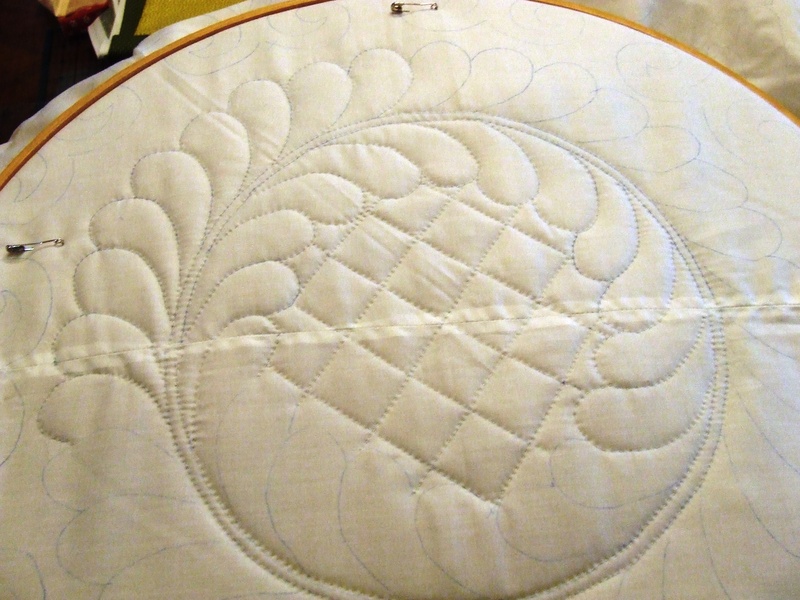 I am hand quilting it with black perle cotton thread #12 and a size 5 embroidery needle. 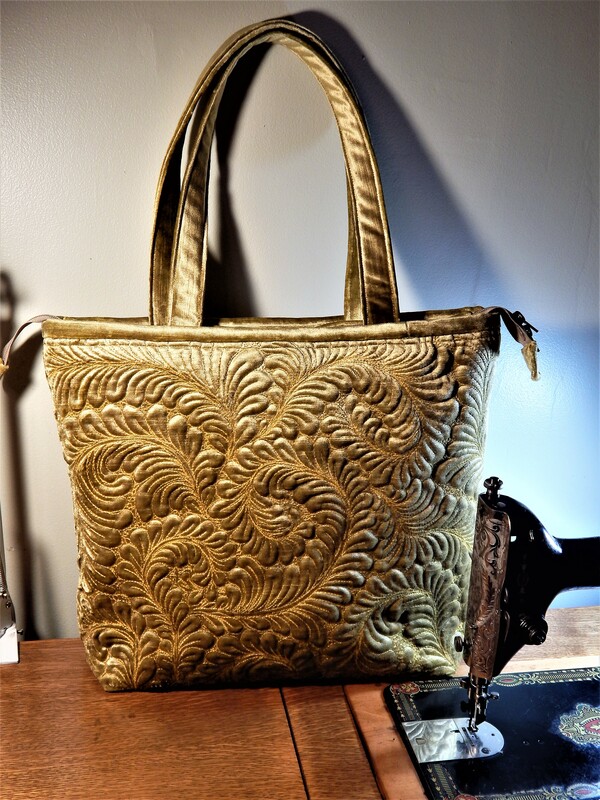 A note about perle cotton thread; it is different than embroidery floss. Embroidery floss is not a good choice for hand quilting. The individual strands are not as strong and are not twisted together like they are in perle cotton thread. I am not marking this. 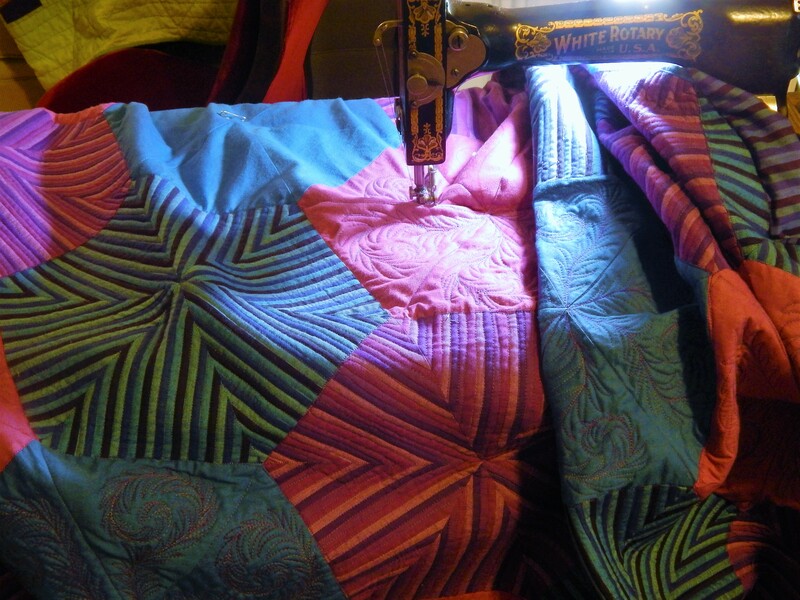 I am just quilting around the pieces and then adding 3 more rows by eye . You can see Teddy on the far left checking my work. 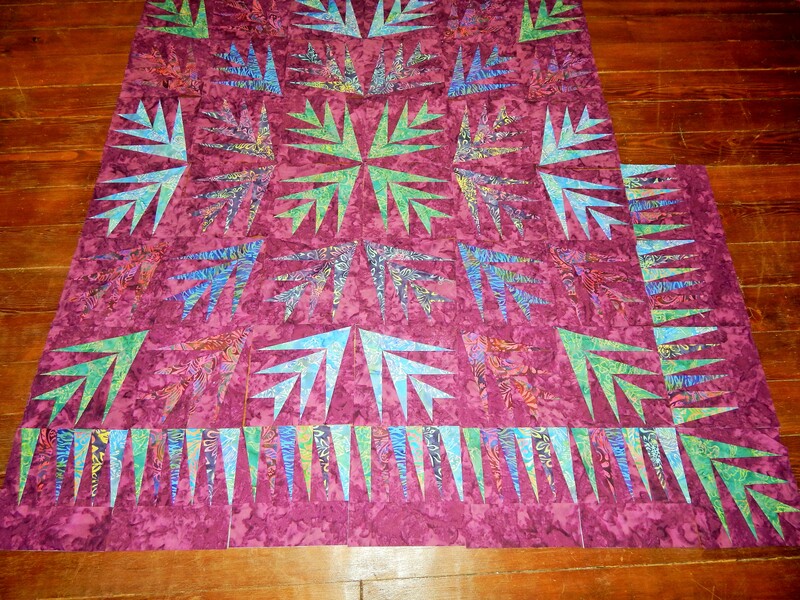 I did make a few more border pieces for the Batik Quilt. 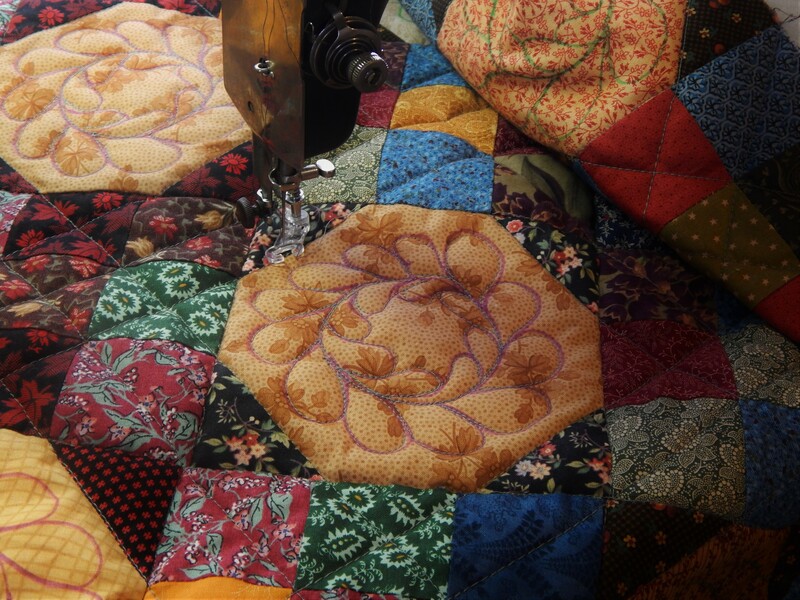 This entry was posted in Flowers, Quilts and tagged hand quilting, perle cotton, Teddy Quilt. He’s a very lucky puppy. That’s a very superior quilt! 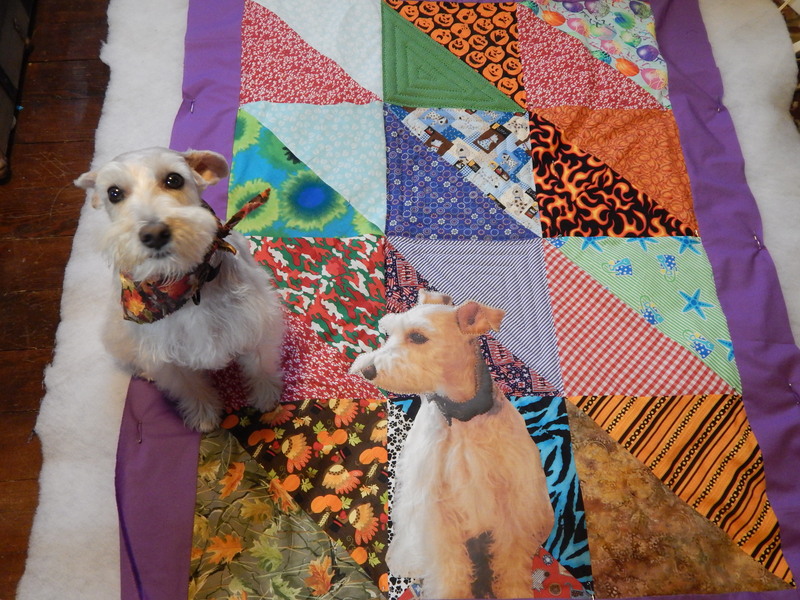 Teddy looks so proud of his quilt. I can’t believe all the hobbies you have, Tim, you are very talented. 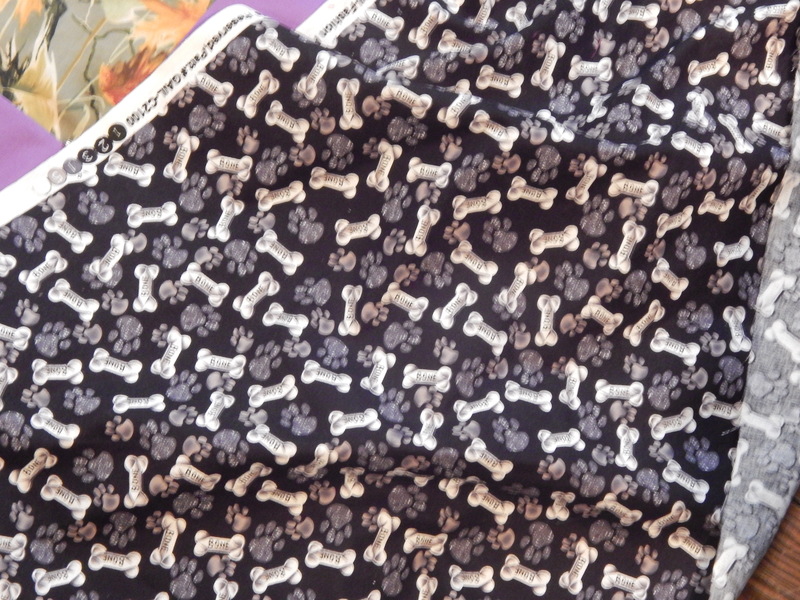 I have been collecting ‘dog’ fabrics for a while to make blanket/beds for the boys Rocky & Sam. This is perfect! Motivated to get started now. Also your “beginning” flower arranging class…..stunning. So much talent. Wish I was closer to take your classes. Also Tim-what size are your finished squares? Tim and Teddy, you guys just cheer me up every day. I’m smiling right now! And Tim, your flower arrangements are lovely. Reading Tim’s comments & blog always brightens my day too. I love Teddy as much as my 2 Westie boys. I am a born & raised Wisc girl so it is possible the boys could meet on a visit some time…….you never know! 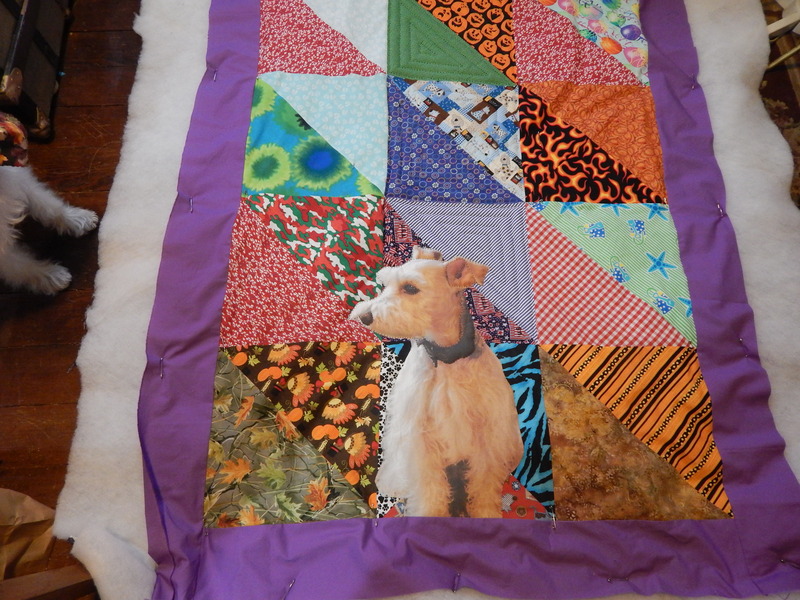 I love love love the Teddy quilt! I had to laugh when I saw the subject line…after your last post Teddy gave you a talking to, didn’t he? He sat you down, looked earnestly into your eyes and put your priorities straight. 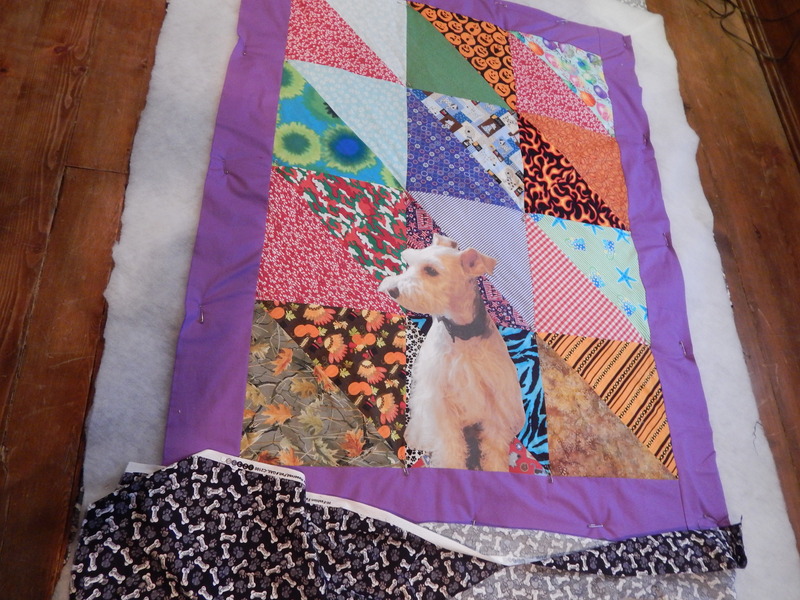 Forget these quilts in progress — who’s your puppy daddy? The Teddy quilt. That’s the priority. Glad to see you got that straightened out. My daughter has a Schnauzer who comes home from the groomer with the little scarves. She has saved all of them so I can’t wait to show her what you did with Teddy’s! That is so cool! Does Teddy get to keep and sleep on his quilt? Saw your quilts at the Des Moines quilt show this weekend. Fantastic! 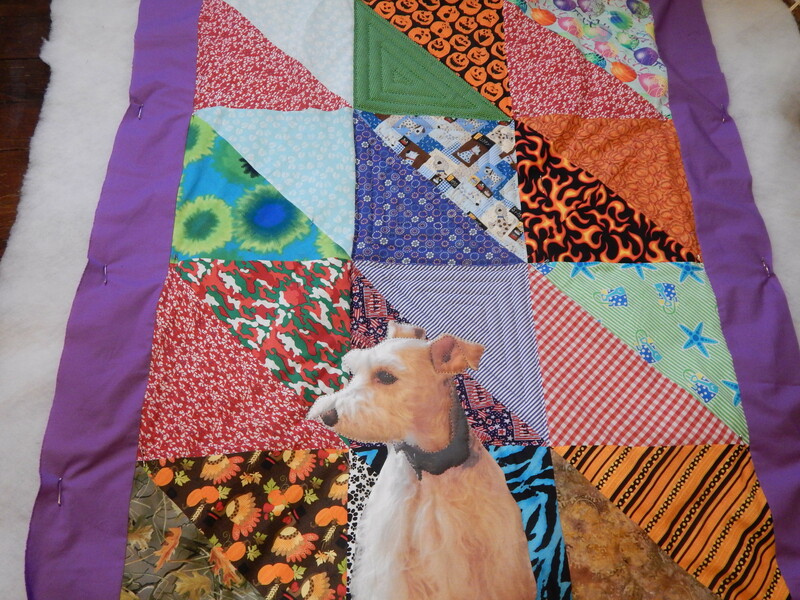 Also enjoy your blog and the updates on teddy..
How wonderful the Teddy quilt! Love love love it! P.S. the flowers are marvellous also!